Barbara Koenen Holm received a Master of Music degree from The Boston Conservatory in 1990 with a major in flute performance. While at the Conservatory, she studied with Robert Stallman, and she has also studied with Emil Opava and Adele Lorraine of the Minnesota Orchestra, and Irene Pruzan. 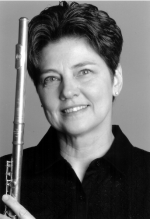 A member of the St. Paul Civic Symphony for over 14 years (1976-1987, 1999-present), she has also been Associate Principal Flute of the Metropolitan Wind Symphony of Boston (1990-1992.) She has been an active participant in many chamber ensembles including The Highland Park Trio (1985-1987) and L’Ensemble Caprice (Denver 1995-1999) and other woodwind quintets, trios, flute and piano duos, and flute and cello duos. She is the founder of The Legacy Ensemble. She is a dedicated teacher, and is a member of the faculty of St. Joseph’s School of Music in St. Paul as well as having a studio in her home. She has studied composition with Larry Bell of Boston (1988-1992) and Chris Granias of Minneapolis (1999-2000) and does arranging and composition for this trio. Her music is available at Holm Legacy Publishing. 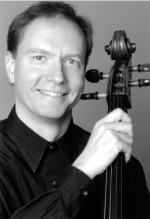 Daryl Carlson, a native of Minneapolis, began cello studies with Paul Thomas and Ruth Fischer. He went on to studies with Tanya Remenikova at the University of Minnesota and with Sachiya Isomura and Mina Fisher. He has held the position of principal cello with the Augsburg College Orchestra, the Little Symphony of Minneapolis, and Allegro Symphonia, as well as performing with the Civic Orchestra of Minneapolis and the Bloomington Symphony. A regular performer in freelance orchestras and ensembles throughout the Twin Cities area, he can be heard and seen in various film, audio and stage productions for such performers and artists as Prince, the Dixie Chicks, and Theatre de la Jeune Lune. He is an original member of the Nokomis Piano Quartet formed in 1990, and of The Northern Lights String Quartet, formed in 1998. He has also performed for Schubert Club Metropolitan Artist Series Concerts, and as a member of the Two Rivers Piano Trio. He performs frequently in solo and chamber music recitals and is an Artist Member for Thursday Musical. An active teacher maintaining a studio of cello students, he has also participated in many school presentations as an individual or as part of an ensemble. John Holm is a native of St. Paul. 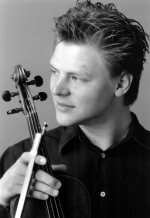 He began violin studies at the Longy School of Music in Cambridge, MA under the direction of Clayton Hoener. After moving to Denver, Colorado he continued his studies with Robert Stoyanov of the Colorado Symphony Orchestra. John has played in numerous ensembles, including the Denver Young Artists Orchestra, and The Saint Paul Civic Symphony. He also enjoys improvisational music and electric violin, playing in various rock-groups and jazz-improvisational ensembles. When not performing, and not playing Bach, he is an IT professional.